It is estimated that 5.7 million people in the United States are living with Alzheimer’s disease. It is the 6th leading cause of death in the United States with caregivers providing an estimated 18.4 billion hours of care for their loved ones. Although the greatest risk for developing Alzheimer’s is aging, it is not a normal part of becoming older. Alzheimer’s is a form of dementia that leads to a decline of memory, thinking and reasoning skills. It is a progressive disease that typically worsens over time. Knowing the warning signs and symptoms of Alzheimer’s disease can help you get care. The Alzheimer’s Association has identified the following ten signs and symptoms. 1. Memory loss that disrupts daily life. Forgetting recently learned information is one of the most common signs of Alzheimer’s disease. Your loved one may also forget important dates or events or ask for the same information repeatedly. Some people developing Alzheimer’s may experience changes in their ability to develop and follow a plan or work with numbers. Following a familiar recipe or keeping track of monthly bills may become difficult. They may also have difficulty concentrating and take much longer to do things than they did before. 3. Difficulty completing familiar tasks at home, at work or leisure. Difficulty completing daily tasks or trouble driving to a familiar place might be signs of Alzheimer’s disease. Perhaps your parent has forgotten how to write a check or cannot remember the rules of a favorite game. This might be signs of Alzheimer’s. Does your loved one lose track of dates, seasons or the passage of time? Have they ever forgotten where they are or how they got there? Confusion with time or place may be a sign of Alzheimer’s disease. Some people with Alzheimer’s may have vision problems such as trouble reading, judging distance or determining color or contrast. Changes in vision might also cause problems while driving. Trouble following or joining a conversation or stopping in the middle of a sentence may be signs of Alzheimer&#39;s. Symptoms may also include struggling with vocabulary, finding the right word or calling things by the wrong name (e.g., calling a “watch” a “hand-clock”). Placing things in unusual places, losing things and the inability to trace steps may be signs of Alzheimer’s disease. Occasionally, your loved one might accuse others of stealing their belongings. Shifts in judgment or decision making may also be a sign of Alzheimer’s disease. For example, they may use poor judgment when dealing with telemarketers or may pay less attention to grooming or keeping themselves clean. A person developing Alzheimer’ss may withdrawal from activities that were once enjoyable like hobbies, social gatherings or family outings. You may notice that they have problems keeping up with their favorite sports team or remembering how to perform a hobby. Becoming confused, suspicious, depressed, fearful or anxious may be signs that something is changing cognitively. Your loved one may also feel uneasy when they are out of their comfort zone. Is it Alzheimer’s or Aging? Occasionally forgetting something or misplacing things from time to time are all normal age-related changes. If you notice symptoms that might point to Alzheimer’s, don’t ignore them. Make an appointment with a health care provider to discuss. 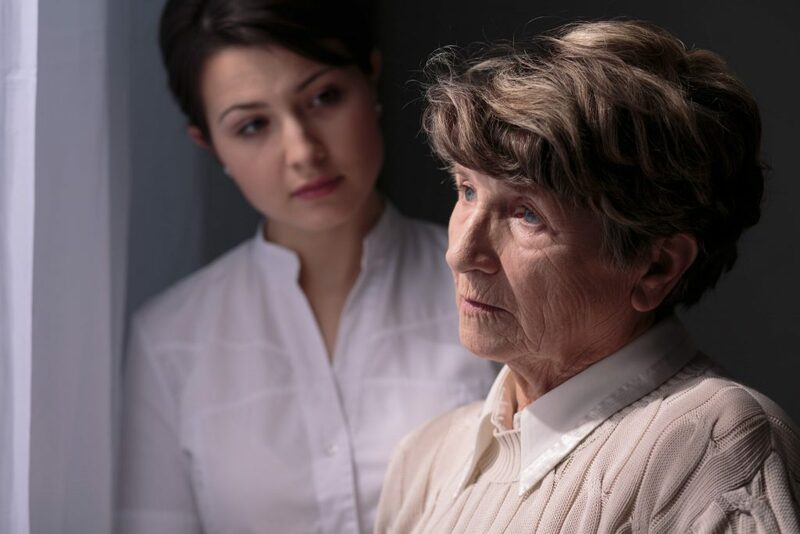 As of today, there is no cure for Alzheimer’s, but early detection can give you time to explore treatments that may provide some relief of symptoms.